I’ve always had a soft spot for Lindsay Lohan, and I really just want her to succeed. As a loyal viewer of her early films all the way to her recent (and tragic) reality show, I do my best to keep up with her career. That said, not everything she’s doing is her best work. For instance, a couple months ago, I took it upon myself to check in on what the f*ck was going on with Lindsay Lohan’s Instagram. From bewildering captions about life to berating her own club’s Instagram account, Lindsay was doing some deranged things on the ‘Gram. Well, that was January, and this is April, but I’m pleased to report that Lindsay Lohan still doesn’t know how to work Instagram. Here are some of LiLo’s best recent moments on social media. Let’s start with Lindsay’s most recent post. She did a shoot for Slimi Magazine, which sounds super legit, and she’s on the cover of their Music Issue. Now, I’m still a proud fan of Lindsay’s 2004 album Speak, but is there any reason that she’s on the cover of a music issue in 2019? I’m already confused, and we haven’t even gotten to the picture yet. I am going to have screaming nightmares about that hair. For Lindsay’s sake, I sincerely hope it’s a wig, but either way, it’s looking more parched than me when I wake up still drunk and realize I forgot to get myself water before I passed out. I’m all for a high fashion moment, but nothing about this look is doing our dear Lindsay Lohan any favors. She already looks about 10 years older than she is, so this 80-year-old-woman hair and super heavy, unblended makeup really aren’t working. Her skin actually looks great, but why oh why is she wearing lip liner that is many shades darker than her lipstick?? Scratch that, is she even wearing lipstick?! There’s no better description of Lindsay Lohan’s Instagram than “????? 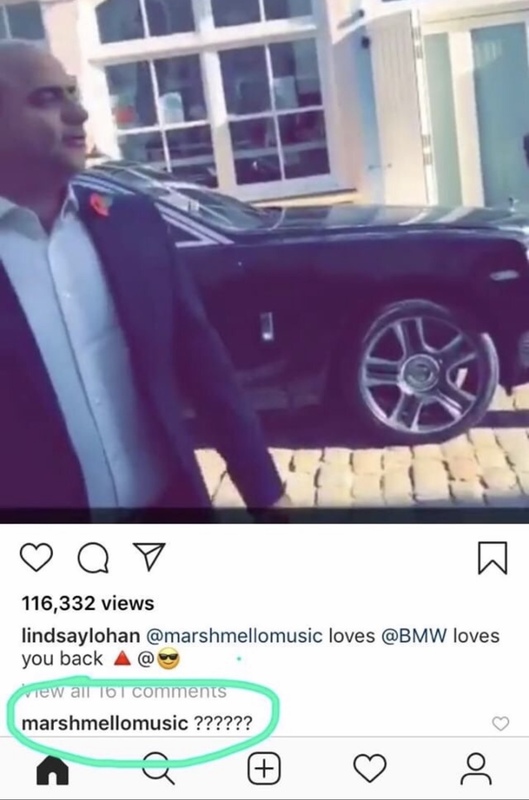 ?” In my last Lindsay Instagram roundup, I dissected a story where Lindsay was listening to Marshmello’s song “Happier,” but now she’s just taken to harassing him about BMWs, or whatever is going on here. Maybe Lindsay took this down because she was getting trolled for the comment, but but usually she’s not that self-aware, so who knows. Okay, so what we’re looking at is a selfie of Lindsay Lohan looking like Ursula the sea witch, with Robert DeNiro in the background. This is the single grainiest photo I’ve ever seen, and it’s also likely old af. I’m unsure of the exact date this photo was taken, but DeNiro was a guest on the first episode of Late Night With Jimmy Fallon back in 2009, so there’s a chance that Lindsay was lurking around and took this on that day. In general, I’m obsessed with the practice of hashtagging celebrities who don’t have Instagram, as if Robert DeNiro is going to be searching the hashtag of his own name. And that has been your quarterly review of Lindsay Lohan’s Instagram presence, thanks for reading! Stay tuned to see which celebrities she’s harassing next time—I’m placing my bets on Tyra Banks.